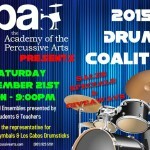 HomeImpression Cymbals Invade the U.S. Impression Cymbals is proud to announce the appointment of ZimMusicInc. as the exclusive North American distributor of Impression Cymbals. Established in 2010, Impression Cymbals is the realization of experienced industry veterans and cymbalsmiths, offering an full line of completely hand hammered, artisan crafted cymbals produced in Istanbul, Turkey. Representing the pinnacle in quality, vision and sound, every Impression cymbal is a testament to the centuries-old craft of traditional cymbalsmithing, perfected by generations of skilled masters. Impression offers a wide range of cymbals including: Rock, Jazz, Dry Jazz, Traditional, Mixed, Smooth, Dark, Hard and X-Hard. All cymbals are cast from Impression’s exclusive B20 formula, and are hand-crafted, lathed, and hand-hammered by skilled artisans. 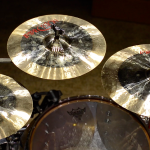 Each cymbal bears a handwritten signature, along with its weight, under the bell as a confirmation of quality. With experienced drummers and percussionists managing every level of the company and production, Impression offers musical cymbals of the highest quality, made from the perspective of performing musicians. 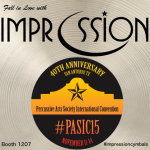 Impression Cymbals will make its North American debut at the NAMM show in Anaheim, CA January 22nd-25th, 2015 at booth 2956 located in Hall D.
For more information visit www.ZimMusicInc.com, www.impressioncymbals.com or contact ZMI at 213 347-3964 or email at info@zimmusicinc.com.